Hope that everyone had great holidays, whichever holiday it may be. 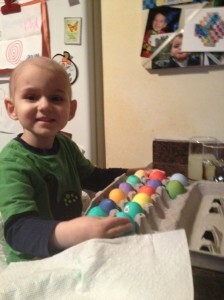 Liam had been asking every morning for a week if it was Easter day so the excitement was built and the morning was a lot of fun. We decorated hard boiled eggs and hid candy/toy filled ones. Frantic searching and lots of discussion about whether Santa and Easter Bunny are pals, made for a great day. Liam deserved a great break after his long week of Chemotherapy. We have been staying on track with the schedule, which is such a blessing. We finished radiation like we thought on March 20th. 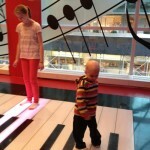 The radiation oncologist was happy with the way Liam was tolerating treatments. He had concerns it would have taken a much bigger hit to his blood counts, so luckily we are hanging tough. It is much scarier going through the second course of radiation especially when the beam is directed at his brain and spine. Hopefully the secondary effects are minimal. We are heading in and out of Children’s regularly for blood products( blood and platelets) Thankfully, we haven’t had to stay the night since his brain surgery. Our New York trip was 5 stars. We flew out 26th and were greeted by my cousin Terry at the airport. It was wonderful to have a familiar place to stay and such inviting company. We had a delicious dinner and made ourselves at home. If I had any choice in the treatment city, I would have picked New York because not only do we have family there but they are unbelievably generous and willing to help. It couldn’t be a better situation. We checked out the Ronald McDonald house before our appointment, it is very close to Sloan (Only a 10 min walk.) The rooms are simple and well used, there is a great set up for kitchen needs assigned fridge and freezer space, cabinets and lots of counter space to prepare food on. It seems like a well thought out kitchen for multiple family use. 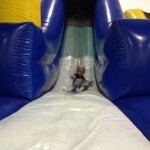 Most importantly for Liam there is a large playroom and seems like daily activities and other kids looking for fun. We were very bare for this trip being it was so short. I feel like we can make the space like home away from home without too much trouble. Sloan is a massive hospital. My cousin, Terry, happens to work in the same area, not connected to the Pediatric Day Hospital but she is just 3 floors below us. You can see why I found this trip a success even before meeting the new team. It was impossible to guess how we would manage the summer but after doing a bit of a dry run it puts my mind at ease. The Day Hospital is similar to Children’s with one major difference, the playroom is better. Liam actually played in it for at least an hour after we were finished. Not a bad way to start things off. It was stress free for Liam, which was very important I hoped we would leave with him wanting to return. The most important part of the visit was meeting Dr Kramer. It was nerve wrecking to meet her because I just wanted it to go well and to like the person in charge of our treatment. She was lovely. She was personable and great with Liam. She seemed so comfortable with Neuroblastoma. It is her life’s work and we don’t have anyone that only deals with NB at Children’s so it was reassuring. Liam’s NB is a fluke to begin with but then for it to go to his brain is a HUGE fluke. We are just continuing to play with the cards we were dealt. As we said before it isn’t until recently that there is even an option for treatment. Dr Kramer described the next phase of treatment as the ‘easiest’ part so far. We were thrilled to hear that. As a pregnant woman I will not be able to care for Liam for long periods of time after he is injected with the radioactive treatments. If Will and my mom were stuck with a super miserable Liam for a whole week it would be way worse than it is already going to be. Back to positives… We don’t have to stay in NYC for the entire summer!!! It is going to be 3weeks of treatment then 2wks in Chicago. If we weren’t 15 minutes from one of the best children’s hospitals in the US we might not be allowed home, but thankfully we are. So, that schedule starts May 6th and ends August 4th( if all goes well and if my math from last night is right) We had to wait and see how Liam was doing before planning on a travel date. 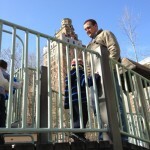 After all that excitement was over we played at the local park and trekked over to the huge FAO toy store. Perfect end to our mini trip. Home again on the 28th, had a much appreciated blood transfusion before the weekend. The mix of radiation exhaustion and healing can leave Liam pooped but in good spirits. We took a family trip to Jump Zone and even though we stayed less than 20 min before he was zapped it was worth the trip. April 2 we started the second cycle of Chemo this was some of the same with an addition of 5 big pills every morning. Thank God Liam takes pills without much trouble. This is where bribery comes in handy. The first day was definitely the worst. Since removing the brain tumor Liam has been super sensitive to IV Fluid causing HORRIBLE headaches. Monday we must have over loaded him and he was in agony. Thankfully, it didn’t occur again that week and honestly it ended up the best chemo week to date. He was bursting with energy. As we expected he crashed on Easter Sunday so we missed meeting cousins and family but quiet holidays are ok too. Monday, April 9th, we defrosted and transfused a bag of Liam’s Stem Cells that we had harvested summer 2010. We were lucky to have leftovers for just this rainy day. This time is drastically different then the last times he received his stem cells. Last year we were in hospital for a month at a time, in isolation and miserable. This time I was just a long day visit and back home. No isolation and the cells were received by Liam without any trouble. We expect the Stem cells to kick in within about 2wks. Anything is possible with them, I pray they mend all that has been broken with all his treatments. Why not hope and pray Miracles happen and only time will tell. The next step causes trouble with blood counts so we needed to boost him up before knocking him back down. That’s where we stand today. Things are looking better today than yesterday and I am thrilled to finally have more pieces to our schedule. The 3 month testing will be 25th thru 27th and then the brain port will be placed on May 1st. As always keep us in your prayers especially during his second brain surgery. Thank you for your supportive cards, wishes and it is so amazing how generous you all are, Thank you! !